Lutron is committed to providing best-in-class products and solutions that offer superior performance, with world-class service and support. Whether it’s the seamless integration of Lutron light and blind control products, or integration with third-party products and systems, Lutron solutions present the reliability and convenient control required for today’s demanding applications. 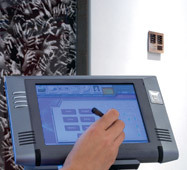 Clear Connect has been deployed in Lutron’s next-generation RF systems, including Radio Powr Savr sensors, GRAFIK Eye QS, and Sivoia QS Wireless.